1. Documents Spotlight　"How to search records including Photographs, a Map and Drawings"
the British Library "The Sino-Japanese War of 1894-1895 : as seen in prints and archives"
"The Condition of Japan Related Materials in the United States of America"
Recently we've been receiving many inquiries from users about whether we hold particular photographs or maps. As such, we'll use this opportunity to discuss how to conveniently search for images with our retrieval system. When you are looking for an item without a lot of text, on the top of the JACAR homepage click the search button so that "Keyword Search" pops up. You can select the input to be in Japanese or English. For practice, let us try searching for "上海市街". Search results will appear on the screen, and you can select conditions with the Show/Hide buttons. You can filter search results by their housing organization as well as document type, language and other options. You can also click to include maps or even drawing in your search. If you use the sample term of "上海市街", you will find [Image 1]. 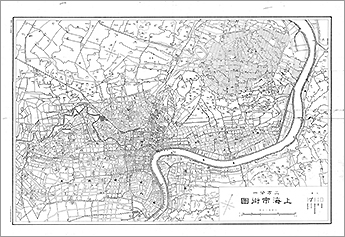 The title "Shanghai Street Map Made in 1937" (Reference Code：B13080908000) will appear in the top of the search results. Try clicking browse to display the picture on the right. 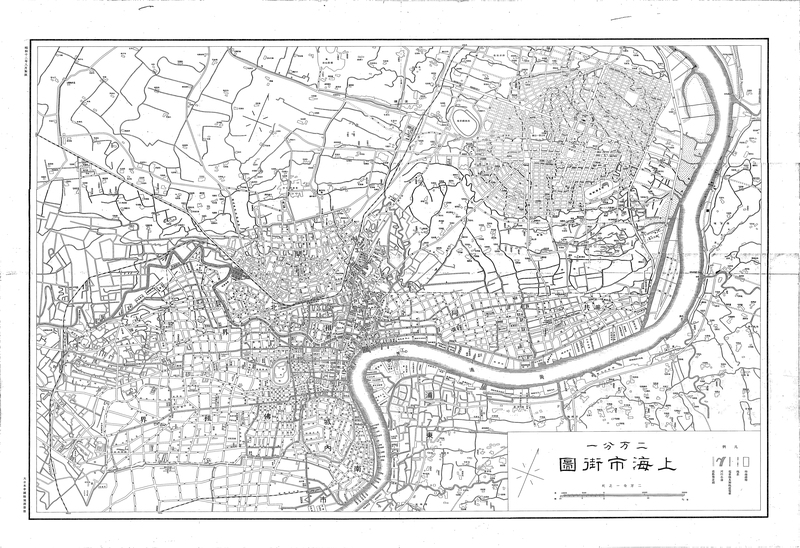 This is a part of "Map of Shanghai City Created in 1937", for which the drawing was created at a scale of 1:5000. As the map is quite large, digital images have been divided into separate parts for convenience. 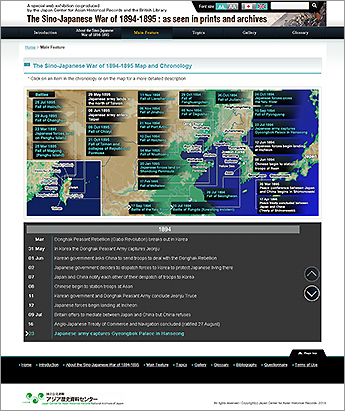 You can try searching in JACAR's database for other maps to places such as China or Korea. You might find it also interesting to take a look at illustrations of the French caricaturist Georges Ferdinand Bigot. We actually receive many inquiries from users about whether we hold his works. The image below, "TOBAE"("TÔBAÉ"), was censored by the Ministry of Home Affairs Police Bureau. To find this illustration, run a keyword search for subjects with "Bigot" and click on "Show/Hide" to select the checkbox that allows you to include "Maps, Drawing, Figures". The full title "1. 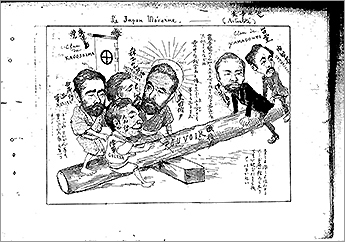 Prohibition of Cartoon Magazine issued by a Frenchman in Yokohama / 9 TOBAE (Vol. 32)" (Reference Code：B03040634900) will appear on the bottom of screen and you can click browse to see other images in the series. 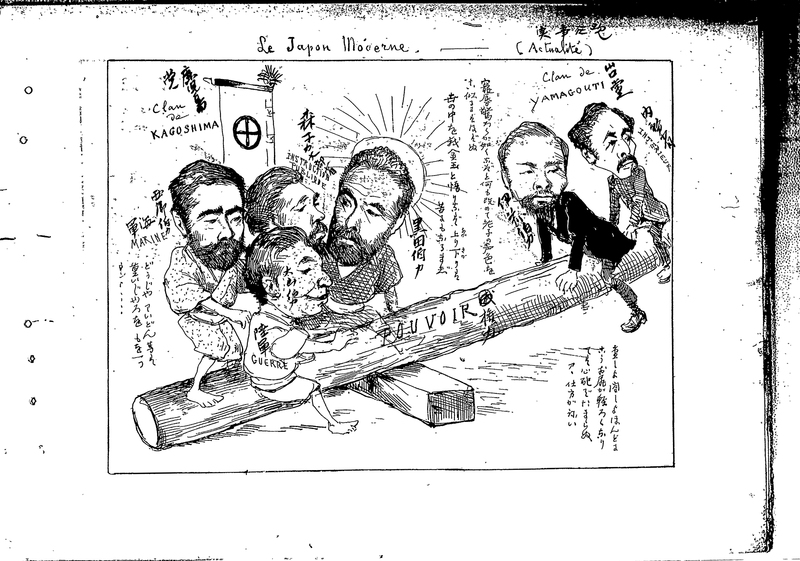 Bigot criticized interclan politics of the Kuroda KIyotaka Cabinet (April 1888~October 1889) by comparing them humorously to a seesaw game. 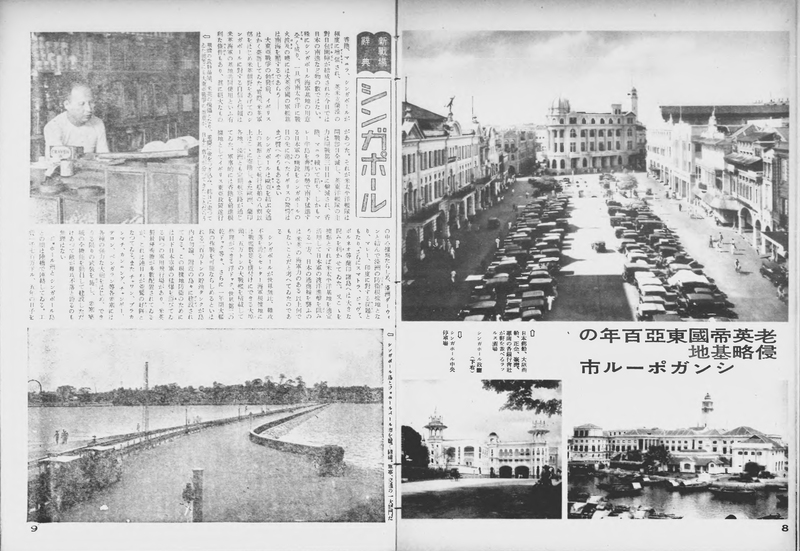 If you'd like to try searching for historical photographs, we suggest taking a look at Shashin Shuho (Weekly Photographical Journal). If you, incidentally, wonder as many do about how to use these photographs in publications or exhibitions, please refer to this link. Let's take a peek at images which circulated in Shashin Shuho of Singapore. 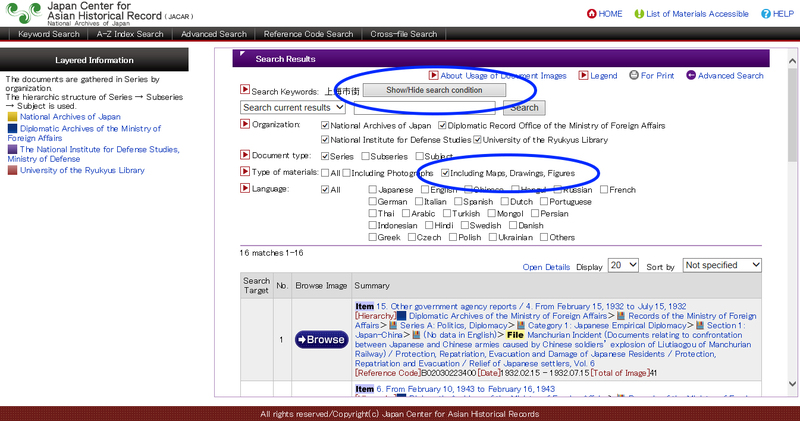 Enter a subject keyword search for Singapore and use the Show/Hide button to include photographs. In the search results you will see the title "Shashin Shuho (Weekly Photographical Journal) No. 206" (Reference Code：A06031080100) and if you browse it you'll be able to enlarge the photographs below of Singapore [Image 4]. The number of materials that you can search for do not yet include all of JACAR's images, but we are currently working to increase what you will find with our advanced search features. Documents include collected research studies on the socio-economic impact of wars as well as their influence on governmental administrative organizations. A manuscript in this series titled "Kokubo-no-hongi-to-sonokyoka-no-teisho (The Essence of National Defense and Advocating for Its Reinforcement)" contributed to triggering an argument for Japanese all out war. In Japan the text was often referred to as the "The Pamphlet for Army". Documents include stenographic records created by Sumihisa Ikeda, who was Chief of the General Planning Bureau of the Cabinet Office. He recorded proceedings of the Vice Ministerial Conference and the Supreme Council for Commanding Warfare Conference, which were both held from August 8 to 14, 1945. The documents show how tense discussions were held at the conferences on whether Japan should accept the Potsdam Declaration or the Japanese ought to prepare for an honorable death in a decisive battle. Documents relate to military railway transportation. One is on a series of campaigns by railway units since the Sino-Japanese War, titled "Railway Affairs during Past Wars"; there is a compilation of railway measures since the Manchurian Incident, titled "Military Railway Records: Vol 1-6, etcetera"; and a compilation of records on the Pacific War Continental Railway operations, titled "Records of Railway Operations". These documents consist of shipping affairs records and landing operations during the Pacific War. The papers pertain to landing operations in the South Asian regions (e.g. Malaysia, the Philippines), transportation operations to the South Pacific (e.g. Guadalcanal Island), lists of transportation ships, and documents related to postwar demobilization. This series includes documents on the bestowal of sovereign portraits and rescripts, imperial entrustment of military flags to newly organized units, and the incineration of military flags at the end of the war. Documents illustrate that flags were respected as symbols of the military spirit. Documents include citations issued for appreciation of units or soldiers, who made sacrifices. Documents consist of statistical information regarding civilian employees of the army. The primary content is comprised of "Statistical Annual Report of the Army Ministry" (1884-1937), which includes statistical records of conscript and volunteers, active soldiers, reservists, war-horses. This document series includes "Record of Operations Against the Soviets", which contains arrangement maps of units located near borders at the end of the Second World War. There are also research papers drafted in preparation for battle against the Soviet Union and data on unit movements pre and postwar under the title "Original Records of Units". Moreover there is demobilization information under both the titles "Distribution Map of Yet Demobilized Soldiers in Major Area" and "Indexes to Locations of Units at the End of War". Documents include town plans and geographic maps of Manchuria (northeastern China), Inner Mongol and the Korean Peninsula, which were drawn by the General Staff Office and Kanto-Gun (Kwantung Army). There is also information on military geography which is not included in "Army Records/ Shina/ Heiyo Chishi" and some documents touch upon Sanko Province, the Ussuri River, and borders of the Soviet Union. This series includes all records of operations made during the occupation of the Philippines by the Japanese army and military administration. "Records of operations in the Philippine Islands" was compiled by the 1st Demobilization Bureau. Japanese and English versions of "Official Reports of Military Administration, Vol. 1-13" are comprised of proclamations, notifications, notices, and other publicly announced articles attached with descriptions. There are also documents for reference such as "Situation of Catholicism" made by the headquarters of military police stationed in the Philippines. Documents are on the Japanese advancement into the Philippines in battles led by 14th Unit Lieutenant General Honma Masaharu. A group of files titled "Overview of Combatant Progress by the 9th, 20th, and 33rd Infantry Regiment" include information on the status of the Japanese army in combat as it assaulted Manila and Bataan, where Douglas MacArthur, Commander of United States Army Forces in the Far East, was located. Documents include "Report on the Manchurian Incident", which was compiled by the Kwantung Army General Staff Office about the incident of September 18, 1931. There is also information on the foundation of Manshukoku (Manchuria) in March, 1932, and proceeding operations. In addition, documents include data on operation units in "Detailed Report on Movements", "Detailed Report of Combat" and "Combat Diary". 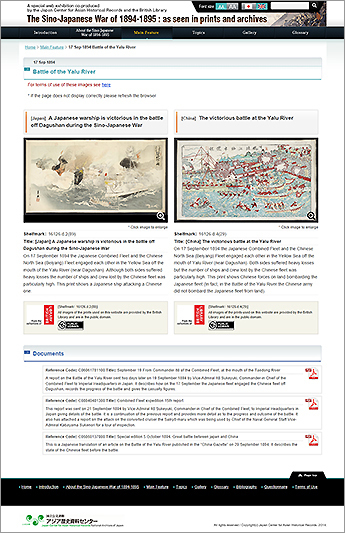 A special web exhibition co-produced by the Japan Center for Asian Historical Records and the British Library "The Sino-Japanese War of 1894-1895 : as seen in prints and archives"
On 27th May, the new special web exhibition "The Sino-Japanese War of 1894-1895 : as seen in prints and archives" was released. 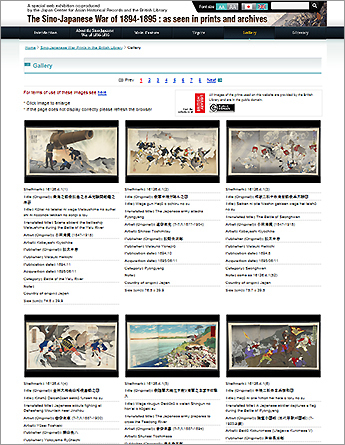 This web exhibition has been produced as a collaboration between JACAR and the British Library. Its aim is to bring together the collection of prints of the Sino-Japanese War held by the British Library and documents made public by JACAR to show how the events of the Sino-Japanese War were depicted and recorded by the people of the time. 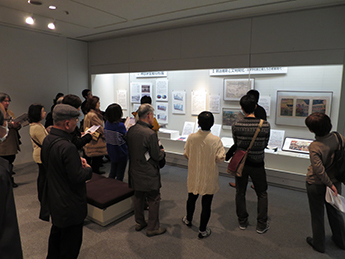 We held the exhibition in a special room of the Meiji University Museum and featured historical materials owned by Senshu University, Chuo University, Nihon University and Meiji University. JACAR's record images were central to the exhibit that focused on Kanda, which was, in the Edo period, a residential quarter of Samurai and Merchants. After the Meiji Restoration a government school was established, and from 1878 private law schools and other places of study were rapidly built. To accommodate a rising demand for legal education, the law schools increased student intakes while expanding. 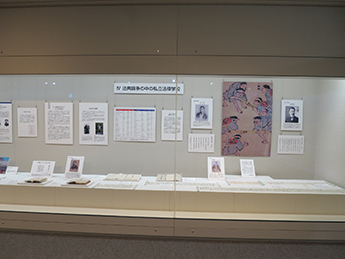 The exhibition focused on the daily lives of students as well as how the "Hoten Ronso" divided into private law schools. In Exhibition I we introduced, with lodging records, the evolving Kanda student quarters and how the students came together to study while sharing living spaces. 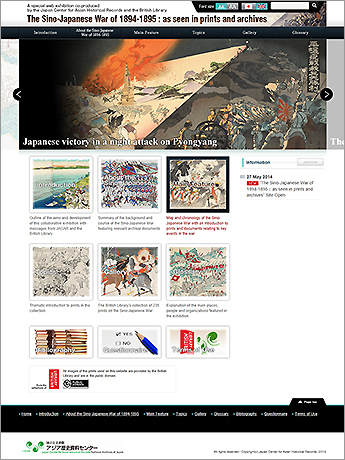 Exhibition II examined the Meiji Restoration, civilization and enlightenment. We focused on the practices of law school founders, in particular how their study abroad experiences in Western Europe overlapped with the turbulent last days of the Tokugawa shogunate and the Meiji Restoration. In Exhibition III we explored how the founders of the law schools went on to lead influential careers as bureaucrats and academics. 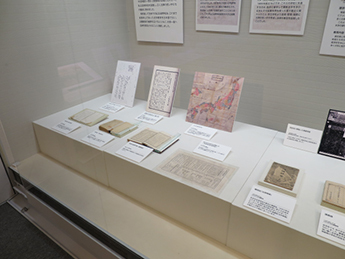 In this section we displayed the Code of Criminal Procedure (Chizai-ho) including the title "Furei Binran, 1888"　which is held by the National Archive of Japan. The Second panel from the left, near the wall is "chizaiho"
We provided a large space for Exhibition IV, which focused on the private schools of "Hoten Ronso". The exhibit examined the different viewpoints forwarded by the law schools on the enforcement of Minpo and Syouho promulgated in 1890. We enlarged a caricature image painted in "Hoten Ronso" and displayed it with letters written by persons, concerned about pressing situations under controversy. The final section, Exhibition V, went over the tarajectory of these private law schools, as they were elevated to Universities. This exhibition enjoyed an attendance of almost 3,000 people. We were delighted to be able to gain the support of many institutions, including JACAR, and want to use this experience to enrich the planning of future exhibitions. Since its founding in 1941, the Association of Asian Studies (AAS) has promoted the exchange of research on Asia. Leading academics throughout the world gather for the annual AAS conference held in a different US city each March. The conferences are known for their excellent academic research reports and lively discussions that extend over 350 panel sessions. This past year 3,419 people attended an AAS conference held in the Philadelphia Marriott Downtown from March 27-30. It was the largest such event held in recent years and was an outstanding chance for intellectual exchange. Each year we participate in the conference as an exhibitor. Not only do we introduce JACAR's materials and demonstrate how to use our database, but we also try to survey participants for ideas to improve our services. 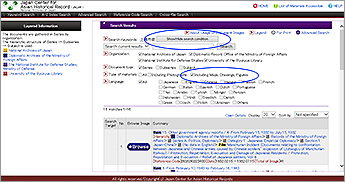 This past year survey results suggested that many people were interested in JACAR's search features, such as the retrieval function refined to include maps and photographs. Our survey was taken by a larger number of individuals, so we feel confident that the data is reliable and spans several key demographics: academics, graduate students and librarians. The survey shows that while 70% of people didn't know of JACAR, many believe it would be desirable to improve metadata (particularly an expansion beyond the first 300 characters of a document in searches). To the question of what kind of other search functions would be useful, the most frequently given response is a glossary search (the term lists of government organizations, titles, etc.). The next two most popular suggestions for new search functions are a tag search (subject matter, field, region, era) and attachment search (reports, magazines, books). The most frequent response on what would be desirable to improve in JACAR's system is the image file format, as many people seem to prefer PDF files over DjVu format. It appears that DjVu cannot be used on Macintosh computers in some circumstances. To better understand the opinions of users, we will continue to do surveys. 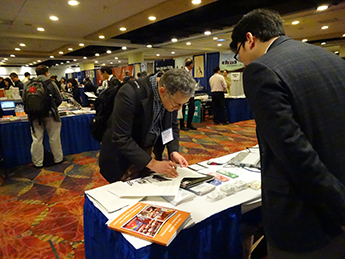 Held booth exhibition at Association for Asian studies (AAS) annual conference 2013. Met with National Archives at Boston members and discussed archival documents. Had a discussion with staff of Harvard College Imaging Services and inspected their facilities. Held discussions about researching archival documents with members of Harvard–Yenching Library. JACAR Director-General Sumio Hatano performed speech "Treaty of San Francisco System and Historical Awareness" and another JACAR staff member also did a seminar for academics and graduate studentsat at Seoul National University's Institute for Japanese Studies and Kookmin University's Institute of Japanese Studies. Had a discussion with staff of Trilateral Cooperation Secretariat. Had a discussion with staff of Northeast Asian History Foundation. 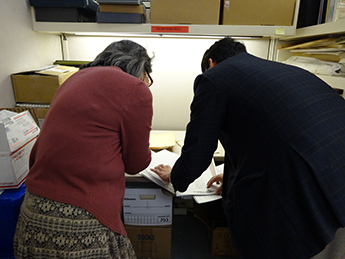 Two JACAR staff member this past March visited three organizations that house Japan related materials. 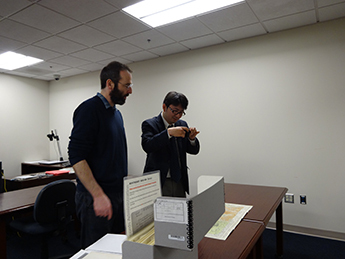 The pair from JACAR conducted interviews about archival digitization and investigated the conditions of materials related to Japan in the United States. The conditions of the three visited organizations are outlined below. The National Archives at Boston started in the 1970s as a repository for records created in the New England Region. 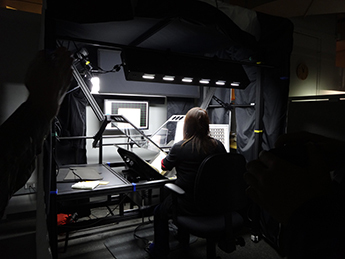 Regional archives operate under the National Archives, an independent federal agency that works to maintain valuable records of the United States Government. It was established in 1934 and now has over 40 facilities nationwide including regional archives, federal records centers, presidential libraries, and other federal institutions. The National Archives at Boston houses a relatively large amount of WWII related documents transferred from MIT. The materials concern the MIT Radiation Laboratory, which was set up by the Federal Government. MIT's Radiation Laboratory was established as the university became engaged in the development of military technologies in the 1940s. Materials at the National Archives at Boston appear to have been drawn up as part of an effort to develop new weapons in response to included items such as new a US Army Air Corps aeronautical chart of Japan and photographs of a Japanese army tank possessed by the U.S. Army in Saipan. These materials as well as others on matters such as naval technologies have been declassified and made available to the public. HCL Imaging Services was established as a specialized section of techinical service in 1997 for digitization of collections hold by Havard Libarary. That's work rooms were the first basement of Harry Elkins Widener Memorial Library, that is HCL central Library and The section has around 40 staff: photographers, catalogers and an schedule controller who are full-time employments and part-time workers. The section has many kind of photographing equipments and materials, therefore we can receive service of digitalization of any material types; digital scanner according to some material types, overhead camera, book scanar scanner for imaging correction. HCL Imaging Service take over thoroughly of digitalization of materials in the university, not only going to carry out that work but also planning of the digitalization project; the proposing and advice concerinig a production control, photographing method, image format, cataloging and how to inventory metadata by specialist staffs. Individuals out of university can also receive a service of digitalaization for a fee. Established in 1928, Harvard-Yenching Library is the largest East Asia focused academic library in the Western hemisphere with over 1.4 million volumes of books. The book holdings include about 810,000 volumes in Chinese, 340,000 volumes in Japanese and 170,000 volumes in Korean. In recent years the library has seen a growth in number of Chinese titles. Although A large percentage of the titles are available in the library’s open stacks, the number of volumes stored in the remote depository is increasing, including a quarter of the Japanese collection. Harvard library's online catalog "Hollis Classic" allows users to type in Chinese, Japanese, and Korean characters for searching library materials. Harvard-Yenching Library holds original documents of the Yokohama Specie Bank produced between 1928 and 1941. Many of these documents are from a New York branch and they include "Tōdoriseki yōroku", "Tōdoriseki gaikokuka nisshi", "Tōkeitatsu kōshin", "Shokanjō meisaihyō", "Kabunushi meibo", and "Kanri kōshin" ("Tōdoriseki Kawaseka"). In addition to the listed documents there are many other survey materials and reports. Harvard-Yenching Library holds original documents created by the Japanese army, although they are not currently catalogued or open to the public yet. These documents consist of about seven file groups that are preserved in three white acid free paper boxes. These documents provide insight into a wide range military administration in Guam, Okinawa, Western New Guinea, and military campaign in China. It seems that Allied Forces had collected them markings of military organization such as "Cincpac-Cincpoa" (Commander-in-chief of the Pacific Fleet and the Pacific Ocean Areas) and "ATIS" (Allied Translator and Interpreter Section) are found on the covers of these seized documents. 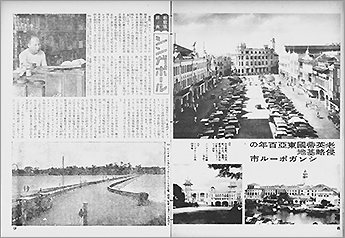 "Shashin Shuho (Weekly Photographical Journal)" - Lifestyles during World War Two as Seen in this Public Relations Magazine -"
Shashin Shuho (Weekly Photographical Journal) was published from 1938 to 1945 by the Cabinet Intelligence Department (later Cabinet Intelligence Bureau). We will focus on descriptions from the magazine concerning the clothes and life of Japanese people. "Japan and Turkey: In commemoration of 90 years since diplomatic Relations were established"
Japan and Turkey celebrate their 90th year of the establishment of diplomatic relations in 2014. The Diplomatic Archives of the Ministry of Foreign Affairs and the Embassy of the Republic of Turkey in Japan co-organize the special exhibition to commemorate it and appreciate the two nation's long term relationship. The exhibition explores the both countries' history of exchange in the modern period, by presenting various diplomatic archives including treaties. 13th International Forum on War History "Historical View of Unified Combatant Command and Combined Operations"
This year marks the centennial of the outbreak of World War One, so we are examining fundamental factors in modern warfare, particularly the Unified Combatant Command and its combined operations. From a historical perspective we explore how to deal with questions of the involved nations and their militaries as well as issues they have overcome. * To participate in this forum apply on the homepage of the National Institute for Defense Studies. Thank you for reading JACAR's 15th newsletter, and we hope you enjoyed it. We will aim to discussed how to use JACAR's materials in oversea and to make the Newsletter an even more useful reference in the future. We believe that and our next newsletter will be sent out in November. Since we aim to make the Newsletter an even more useful reference in the future, we would deeply appreciate any comments or feedback on * THIS FORM *.